What is a pH value? pH is the value of acid or alkali measured on a scale of 1-14. pH 7 being neutral. Lower numbers are increasing acidic, higher numbers are increasing alkaline. Human skin is slightly acidic! The skin's barrier function is performed primarily by the horny layer of the epidermis and the hydrolipid film finely distributed over the skin's surface. Perspiration, sebum and the horny layer together have a slightly acid pH value of 5.5. This acid barrier maintains the ecological balance of the skin: the acid environment and specially-adapted micro-organisms ward off bacteria. Moreover, the pH value assures an especially permeable arrangement of lipids in the horny layer. German made Sebamed pH 5.5 soap-free skin care range has been scientifically developed to the same pH range of human healthy skin, which has a slightly acidic pH value of 5.5, to care for your skin without disturbing its natural acidic mantle. Sebamed has a wide range of skin cleansing and skin care products with a pH value of 5.5. It is a comprehensive program tailored to your needs. It has a full line of skin care products including cleansers, shampoos and moisturizers for different ages and different skin types. The dermatologically correct way to care for your skin. Washing can weaken and even partially destroy the acid protection barrier of the skin especially when alkali soaps are used or when bathing and showering are too frequent. Washing also deprives the skin of oil and moisture. 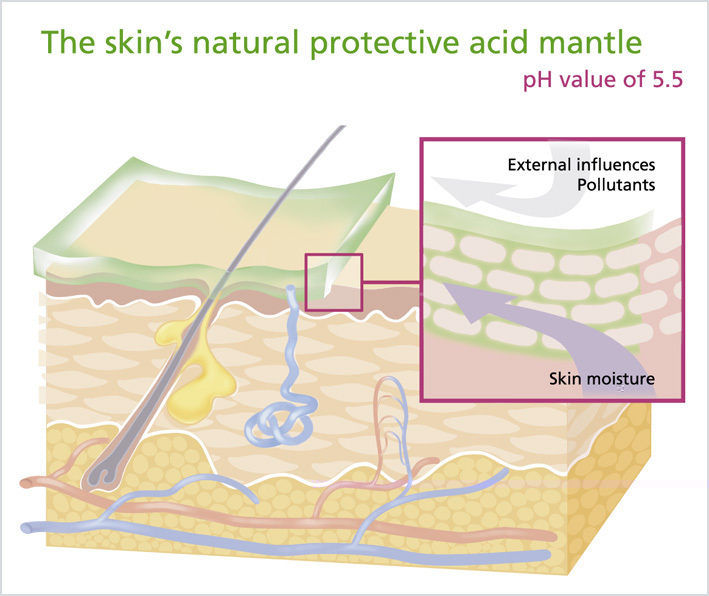 The barrier zone is attacked, there is increased transepidermal loss of moisture, leading to irritation and infection..
Cleansing the skin with acidic Sebamed Synthetic Detergent, with a pH value of 5.5 stabilizes the acid protection barrier, preserves the skin's ecological balance, and sustains its protective function. Superfatted agents have also be added to the syndets. When applied to the skin during washing these agents prevent dryness and keep the skin soft and supple. 100% soap-free, 100% alkali-free, slightly acidic, pH value of 5.5. Preserves the natural acidic mantle of your skin. Unique feeling after washing. Your skin feels clean, softer and more supple. Softens and moisturizes the skin, keeping it supple and healthy. Frequent washing causes no problem. Long term use can easily cause dryness. Clears pores: does not precipitate minerals in water to block pores. Suitable for sensitive and problem skin and protects healthy skin. Promotes the formation of the skin�s own slightly acidic protective function. Alkaline with a pH value between 9 and 11. Precipitates minerals in water, blocks the pores and inhibits the secretions of grease and sweat glands. Irritates sensitive and problem skin. Reduces the resistance-power of the skin. Irritation, allergies, dryness and redness may occur.